March 20, 2018, ©. Leeham News, Toulouse: Airbus launched the 251t version of the A330neo in Toulouse today. The new weight variant increases the range of the A330-800 and A330-900, making the A330-800 the longest range airliner in the 250- to 300-seat segment. 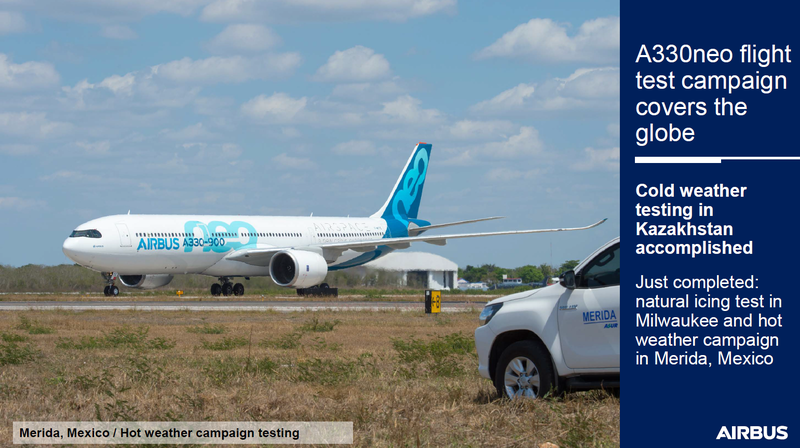 Airbus also presented an update on the progress of the A330neo program, now in the middle of flight tests. Figure 1. A330neo changes from the A330ceo. Source: Airbus. At the core of the A330neo program is the change from engines designed in the late 1980s to updated Boeing 787 Trent 1000 engines. Figure 2. 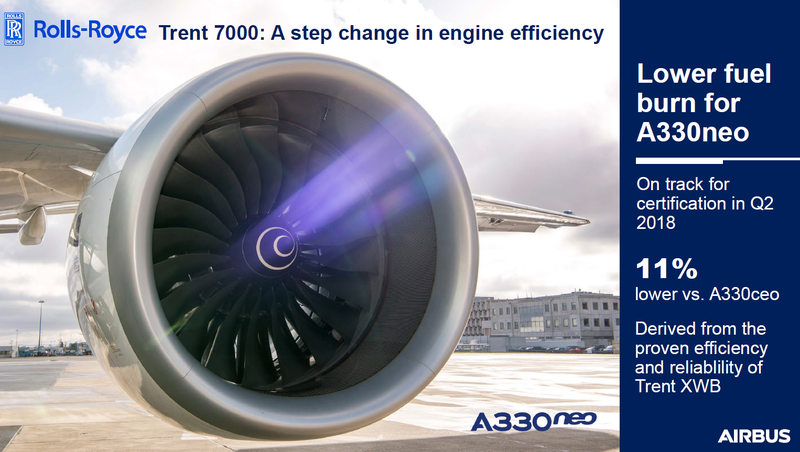 Trent 7000 engine contribute with 11% lower fuel consumption. Source: Airbus. The Rolls-Royce Trent 7000 is a derivative of the Trent 1000-TEN, which was updated with core technology from the Airbus A350’s Trent XWB engines. Another important change for the A330neo is wings with new winglets (once again based on A350 technology) combined with an adapted wing twist, Figure 3. Figure 3. The A330neo has several changes to the wings. Source: Airbus. The number one slat has a smoother integration with the wing and the flat track fairings have been reshaped to an A350 derived shape. With a wingspan of 64m versus the 61m of the 787, the A330neo wing now has a higher aspect ratio than the 787’s wing. The A330neo also has an A350 derived cabin, based on the Airspace cabin program. In figure 4, it’s hard to see there are two different cabins presented, A330neo to the left and A350 to the right. Figure 4. A330neo cabin is modelled after the A350 cabin. Source: Airbus. By moving the pilot crew rest to a common crew rest and introducing new lavatories with smaller footprints, the A330neo cabin can take up to 10 passengers more than the A330ceo cabin at equal seating and comfort standards. The first A330neo Airspace cabins are fitted to the A330neo launch customer’s A330-900s, TAP Air, Figure 5. Figure 5. TAP Air’s A330-900 after paint. Source: Airbus. The A330-900 and -800 were launched and developed simultaneously, Figure 6. The extra cost of developing the smaller -800 is negligible as the variants have over 99% commonality. Figure 6. Development program for A330neo. Source: Airbus. The -900 is now halfway through its flight test program, with A330-800 starting flight test soon. Among the tests completed are hot and cold testing, Figure 7. Figure 7. A330-900 goes places to find cold and heat soaks. Source: Airbus. Part of the reason for bringing the A330-800 to market is the expected replacement market for the A330-200. This model entered the market five years after the -300 model, Figure 8 and 9. Figure 8. Entry into service of A330 variants. Source: Airbus. 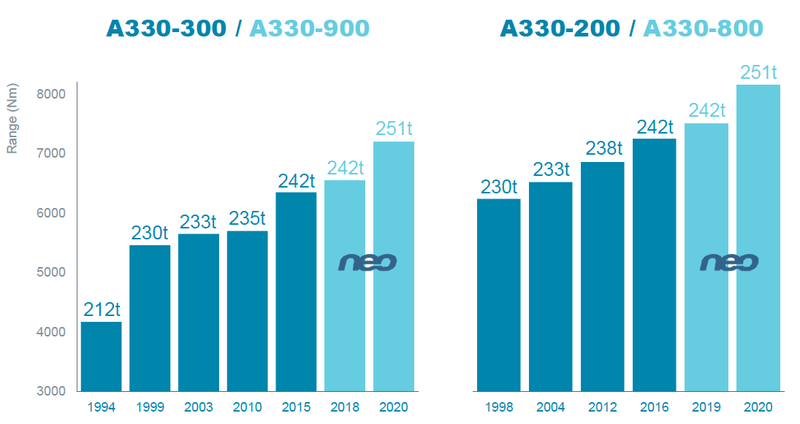 Sales picked up for the model 2005-2008, therefore the replacement market is dragging the A330-300 replacement market with about five years or more. Figure 9. A330-800 roll out from FAL recently. Source: Airbus. The Boeing 787 was designed to kill the A330, which had killed the 767 for Boeing. It didn’t quite happen, Figure 10. Figure 10. A330 and Boeing 787 sales. Source: Airbus. The resulting strong sales of the A330 means it’s now the most spread widebody aircraft with 107 passenger airlines operating the models. Figure 11 shows the operational spectrum for the A330. It’s unusually broad. The size of the bubbles shows the size of the fleet. Figure 11. Average seats and flight duration for A330 airlines. Source: Airbus. The longest flight duration in Figure 11 will increase further. Airbus today formally launched the 251t version of the A330neo, both for the -900 and -800 versions. This increases the maximum range of the models, where the -800 now flies longer than Boeings longest range 787, the 787-9, Figure 12.The variants will be available from 2020. Figure 12. Maximum range for A330 versions. Source: Airbus. Boeing states the full passenger range for the 787-9 as 7,635nm. Conditions for the A330-800 and the 787-9 are not the same. We will put both in our performance model, weed out the differences and report the apples-to-apples range difference between the two in an up-and-coming article. 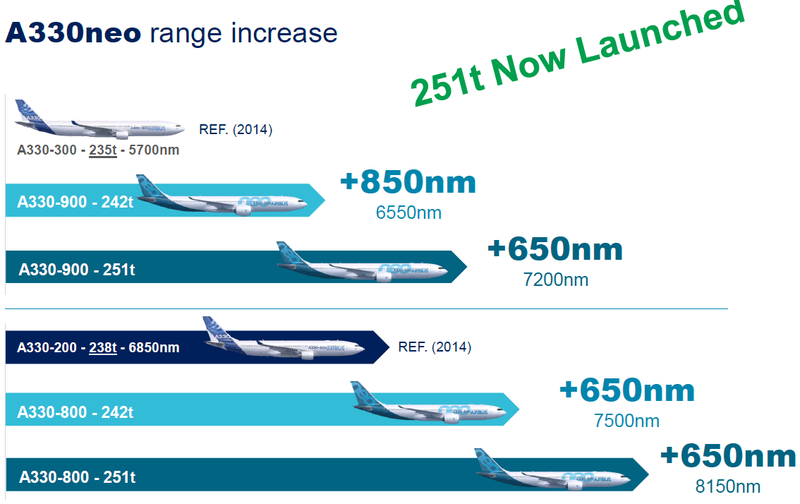 Figure 13 shows the development of the Maximum Take-Off Weight over the years and by it the range of the A330 variants. Figure 13. Maximum range versus MTOW over the years for A330 versions. Source: Airbus. Any clues from Airbus if it’s better than expected performances or lower than expected weight? There is a couple of things. The launch 6200nm range was with 310 passengers in a two-class cabin. The 6450 and then 6550nm range was for the new 3 class cabins with 287 seats. The 7,200nm is then the 251t version with 287 seats in Business (smaller than for the 310 seat 2class version), Premium economy and then economy for a total of 287 pax+bags instead of 310. Any other type’s history U dig as well? Otherwise, your declaration is an easy way to tell which camp, A or B, U are siding with…. Which are typical assumptions by the uninformed general public re why a particular type seems to hv gained performance in which a manufacturer’s mkting team partially rely on to generate ‘positive’ PR news about a product. Lesser known is when a manufacturer play around with cabin config/ density and therefore payload assumptions in order to deliver seemingly larger magnitude of improvement fm the same product than it actually would under controlled/equal conditions. Bjorn has already explained this in his comments. By my observation, manufacturers never advertise it whenever they tweak their load assumptions for the same product even though they are always eager to advertise performance gains. Don’t get me wrong. I believe 330Neo clearly has gained additional performance throughout its development over & above its initial specs released @ launch in 2014. However, we’ve to take those deltas claimed by Airbus with a grain of salt instead of taking them @ full face value. Love your newsletter but it would be so much more credible if you didnt come across as a mouthpiece for Airbus. The bias displayed undermines your credibility. As an example didn’t see a single chart in this article sourced from Boeing. @Adrian, you dip: this was an Airbus event. Tomorrow is the first delivery of a Boeing 737-9, a Boeing event. Tomorrow will be all about Boeing, not Airbus. JFC. And there I was thinking it was a perfectly well written and informative article on the A330? I am confused as I thought the closest Boeing to Airbus was Charleston and Alabamian, still a bit of a stretch (pun), I think Georgia is in between? As I recall in my travels, Georgia (nor Alabama I think they setup on the South coast?) is what my friend refereed to in our travels in that area, as wafer states (Kentucky, Tennessee) So a ways off. And the closest wide bodies are built is Charleston and Toulouse. Seems hard to get them in the same space even if you we not ‘ just talking about the A330NEO up-weight version (which seems to be the point of the article . I guess I have to go back and re-read it. Agree with Adrian and Bjorn. Scott seems to be implying that it is perfectly acceptable to regurgitate whatever the OEM says if it is that OEM’s event that you are at at that point in time. I don’t think that was Adrian’s point and Bjorn hinted on the forthcoming ‘analysis’ which I look forward to reading. I was surprised that the dearth of orders for this ‘longest range widebody…’ isn’t directly referenced as far as I can tell. We could do without the blasphemy even in acronym form, no? The title of this site says “news and comment”. I understand the term “news” as a reference to traditional journalism that aggregates and relays information without stirring it up with opinion (something rarely found nowadays). This post is news, giving the reader an unobscured impression of the event. The article doesn’t say that this site agrees with Airbus’ claim, but indicates that the figures will be analyzed in a follow up post. That would cover the “comment” part of this site’s claim and if the opinion to be posted was biased, it would be right to criticize it being so. I’d guess that the issue here is that neither @AW and @tortugamon would have commented in such a way on a piece using Boeing PPTs about a Boeing product — or put in another way; a case study in the implicit bias on the part of @AW and @tortugamon. Quite the contrary @OV-099, I’d take Bjorn’s analysis over just-Boeing or just-Airbus’ analysis any day of the week. Otherwise I wouldn’t be here. But feel free to jump to conclusions, that’s cool I guess. @tortugamon: Call me old fashioned but I think when you get invited to an event, you don’t piss on the rug at the event. You report what’s there. The “comment” (as in Leeham News and “Comment”) comes later, if warranted. Airbus was rolling out the A330-800. Boeing today is have a party of sorts for first delivery of the 737-9. Embraer next month has a party for the first delivery of the E2. What’s wrong with reporting the party? Any critique can come later. Also, if they released any details on how they achieved 251t on these HGW variants would be interesting to read. The 9t bump doesn’t usually come for free. Finally, the Airbus team seems to be implying the lack of orders for the A332 is due to the A332 replacement cycle coming a few years after the A333-replacement cycle seems to ignore the fact that the A333ceo now (and the A339) has a similar range than the A332 did at EIS. The A339 should even burn less fuel while carrying more cargo and more passengers. The A338 seems dead on arrival unless these FedEx & UPS freighter orders materialize due to limited availability of the ‘dead’ 767. When was the last time a commercial aircraft was built with zero orders? I agree that you quote what they say and make some careful comments about their most aggressive claims. RR must decide how to use the -TEN parts flowing in to Derby either to build T1000-TEN’s with customers screaming to replace their old T1000’s or make T7000 to Airbus. For Airbus it is critical to get the A330neo out to show what it can do with its long wings in airline operations, if B787 customers get all the engine Airbus is stuck and time goes by enforcing the 787-9 lead. Totally fair game. Unfortunately, some readers obsessively siding with either camp refuse to recognize that…. I made the article and understand your comment. As you should know we don’t buy any claims from Airbus or Boeing re their figures for range or economics of their products. The reason I put the spin on the article is that I have checked the range differences. The data behind it will be described in an article in the next days. Re the style of the article. It was a presentation with good info. Rather than write a lot I put the slides for everyone to see. I think the MTOW vs range is a nice historical summary and the operational airline average flights vs pax will be interesting to a lot of our readers. We also like Boeing’s presentations and present these. I found the article interesting, but my beef is the headline, which as written creates the impression that Leeham accepts Airbus’ claim. It is not until deep into the article that you say you will test the claim in your own model. The fact is that these slides are not easily available to the public. So that’s news to me. The fact is that these slides are not all about commercial smoke screen… as we are provided some details (but of course not all) on the optimization to the NEO or statement that going 251 t is weight neutral (slide not published by Bjorn). What really makes LNC different is that LNC is able to fact check range / weight / fuel burn / and more assumption. And to my knowledge it is unique and totally non partisan. Of course you have to subcribe to see the whole picture…. I guess Boeing fanboy should give a look at Bjorn’s analysis of the NMA that is now almost 1 year old and still spot on ! Maybe Leeham could just tweet. Thanks Bjorn. Good to hear your clarification. Even if we cut 1000nm on each variant to a more realistic range, the performance would be quite close to a 787-9 which is quite impressive. 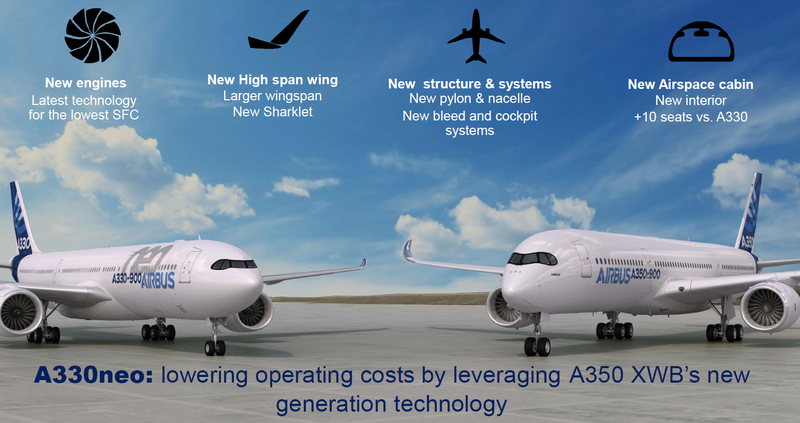 Now I wonder how much more will Airbus charge for the 251t version as capital costs is their key to remain competitive. I don’t think we need to cut 1,000nm fm the claimed ranges of 330Neo even if putting them under Boeing’s tougher(In my personal opinion) mission weight assumptions(e.g. pax+bag weight, premium J seat type, seat distribution across classes, etc.). More like about 700nm discount against Airbus’ claim I guess. We already know 339 has practically identical usable cabin floor area as 789. We also know Airbus now claim the longest range for a 339 will be 7,200nm available for delivery fm 2020. After discounting fm Airbus claimed range to match Boeing’s mission rules/weight assumptions, 339 should return about 6,500nm with 287 pax+bags. A 789 can fly 7,600nm+ with 290 pax+bags per Boeing specs. Estimated diff between this pair is therefore 1,100nm or roughly 2.5hrs cruise duration. Some folks will argue 2.5hrs shorter cruise is still “close to a 787-9” but clearly, other folks won’t…. 789=LD3 x36 positions. None is required for crew rest or belly fuel tanks. 339=LD3 x33 positions. At least 4 positions needed for crew rest(especially now that the off-duty pilots are relocated here fm the main deck) + may be 2 positions for modular fuel tanks. For a longhaul LCC, paying more to buy a 789 instead of 339/338 may be a waste of $ because Rev$ cargo may not be important….not the case for a longhaul FSC with far lower cabin density and therefore more lift margin for cargo payload. Thank you. This was very helpful! In real longhaul mission config, a 789 generates 33.3% more belly cargo space for pax bags and/or Rev$ cargo than a 339. Do you then have the payload to fill that bigger void? I understand what U are getting at but U are missing the bigger picture in how a 789 can always carry more cargo weight, not just volume, than a 339. Let’s assume my estimated diff 789 vs 339 in cruise duration is 2.5hrs. That means @ full pax+bag and over the same route @ the max distance a 339 can fly, a 789 has the extra payload weight margin, equivalent to about 2.5hrs worth of fuel weight, to carry more cargo above a 339. It was seriously out of date in terms of load per pax and cabin config assumptions…..completely out of touch with airline op realities since around early 2000. I mean who dared to assume 45″ or less pitch for a J recliner, even for long haul birds, except Boeing? However, Boeing massively updated it around 3yrs ago(Can’t remember exactly when but I recall it was shortly after 77X launch) to much better reflect today’s airline op realities….to a point that it became much stricter/tougher than Airbus’ mission weight assumptions. Many industry media, including leehamnews.com, dove into the details which I hv read about. Airbus also tighten their weight assumption in recent yrs but remain lax about realistic cabin config(e.g. J is still not horizontal flatbed and no direct aisle access for every J). I hope U now know I hv not only “read the fine print” but also followed how “the fine print” has changed over the yrs @ each manufacturer. Mate, you had a good start but then lost it. If you fly long missions close to max. range of the aircraft, your cargo hold isn’t completly filled, unless your cargo is feathers – high volume, low weight. You need your weight for fuel, not for cargo. So your calc about 30% does make more sense for mid range missions, but do you need a crew rest on a 6-10h flight? You might argue if the aircraft is used for longer missions also you have the crewrest built in anyways. Not sure if that’s valid, you can optimize that for sure and on long missions you want to fly a different layout anyway, more C, more Y+. To doubt Airbus range specs and just discount them is a little meeh. Everybody knows A & B meassure different, but it’s very hard to just assume one is better in a point. It’s very hard to judge A330neo has a shorter range due to older fuselage build of Al. Engines are same tech, but the wing and that very optimized fuselage should not be that much worse than the clean sheet (and well designed) B789. As I see Boeings ambition to cut price just to kill A330neo on arrival, I assume the A330neo is pretty close to par with the B787. I’m quite impressed so many A330 are used on short range flights. How much can be gained in optimizing a plane for this flights? I have not seen official OEW’s for the NEO’s but that for the 333 is about 7T less than the 789, this could add up on shorter haul missions. Think the 330NEO’s are starting to turn out to be very competent replacements for those airlines operating 330CEO’s. If they want higher capacity and range the 350’s must be the choice. At equal mission distance and both @ full pax+bag, a 789 can still carry more cargo payload weight than 339. Depending on your definition for “mid range”. The shortest Trans-Pcf route between 2 major cities is usually SEA/YVR-NRT about 10~11hrs block time westbound. In classic definition, it’s longhaul, not mid range. Regardless, DL/NH hv deployed 333/789 on that route for yrs and I suspect it’ll become a 339 route for DL shortly. Including margin for the strongest headwind, that route won’t be more than 4,600nm for mission planning which is 60% of 789 max range or 72% of 339 max range. Both will easily be able to carry some belly cargo weight but clearly 1 can do far more than the other….this is where the larger belly space has less chance to run into volume limit. According to the 8hrs duty time limit typical for crew regulations(either legal or corp guideline) worldwide, U don’t for 6~8h but U do for 8~10h and above. If we are talking about how 339’s new found capability to do upto 13hrs block time can cause a customer to order it instead of 789, we should be expecting more 339 missions will be 8~10h+ than 333 ever was expected. Not sure what do U mean by “built in” but the designs for all 330 crew rest unit below deck hv always been modular thus removable….obviously takes way more than a few hrs to convert though. Also no idea what U refer to as “you can optimize that”. Basic design for that crew rest has been around since the days of the 342 debuted 20yrs+ ago. There’ve been updates but mostly about creature comfort rather than structural weight reductions. The op reality is that these birds in FSCs are used back-to-back across shorter/medium haul routes and longer intercon routes in their daily rotations. I’m lucky to be based in E.Asia and routinely observed how NH flip a 789 between say PEK-HND and HND-YVR or CX flip a 333 between SYD-HKG and HKG-SGN on a daily basis. Which will be equally true for a 789 so no influence to the diff 339 vs 789 in terms of cargo lift capability in both weight AND volume. 1. I hv never ever said “better”. I just said 1 is tougher than the other….and it was the opposite 5yrs ago. 2. It’s not an assumption and clearly not preconceived notion. Read my comment to Uwe to understand how I’ve followed and learnt the diff weight/config assumptions now actually used by Airbus vs Boeing. The MTOW of the 789 is only 3T more than the 339 but its OEW is 5T more (?) than the 339. Fuel burn burn on a sector of 5000Nm miles could be within 5% (? ), so where is the 789’s big advantage? That’s absolutely correct figure with no room for diff interpretations/definitions because there’s only 1 way to measure it and regulators worldwide depend on MTOW to govern these 2types. U fell into your own usual/predictable trap of assuming manufacturers use exactly the same method+weight assumptions(e.g. what are included as Operating Empty?) to measure OEW. Apple vs orange comparison in a nutshell. 1st or all, they’re under no obligations to follow each other’s method. 2ndly, regulators don’t give a hoot about how high or low is your OEW….U can fly your 330Neo/787 with half the cabin unfurnished with no crew rest module(for 330Neo), seats, lavs, partitions or even carpets if U wish as long as it doesn’t pose a safety risk to the furnished cabin on the other half. A figure popped out of your hat? or just take Airbus’s claim as bible? Possibly located somewhere else within your hat? But math for the above ops don’t look right for 789 because on Boeing brochure, range spec says 7,635nm. These flights should be out of fuel and dropping out of the sky b4 they reach destinations or unscheduled tech stop/significant seat blocking for most days….meaning these routes should not be surviving commercially by now. But they are and SFO->SIN has been around for 1.5yrs. Why? Boeing’s 7,635nm is for 290pax+bags while QF and UA configs are for no more than 252pax+bags. QF gained nearly 1,000nm above Boeing’s brochure range by ditching 54seats(i.e. pax+bags) fm Boeing brochure config. See how config massively affect actual range(and why I claimed Boeing brochure specs these days are conservative relative to actual airline missions). Even more tricky when diff manufacturers use diff config/payload weight assumptions. This is your persistent problem for trying to compare all spec figures straight off brochures like U would with 2 smartphones brochures by Samsung and Apple….it doesn’t work that way in commercial aerospace. Now picture a 339 even @ 251t MTOW and @ similar cabin density as QF’s and UA’s 789. That’s clearly a longhaul frame on par in range with the good old 744 intercon workhorse….in a nutshell, it can fly upto where 744 used to fly. That’s why Airbus 330Neo sales chief said 339 is good for LAX->SYD which I can believe. But LH does not equal to ULH as they are very diff arenas and if U deploy a 789 on classic LH routes, it can still lift more cargo weight than 339 on the same routes. U may mark my words: No operator will ever deploy 339 on ‘crazy’ sector durations like SFO->SIN(e.g. theoretically similar to OAK->KUL by AirAsiaX) let alone LAX->SIN or PER->LHR but they will with 789. Fm another angle, if 339 is capable for ULH because it’s equal to a 789 by brochures, no point to invest in a 359. Thanks for a spending a considerable time responding. Your passion for the the 787 is admirable. But I will keep on enjoy flying 330’s wherever possible. Just a thought, without the 339 being there BA could have asked much more for the 789. For just being there its squeezes the 789 profit margins. Offering an even higher MTOW version of the A330-900 will surely make it a more attractive aircraft, but also further reduce the chances of the A330-800 to acquire customers. The A330-900 has become a “best of both worlds” aircraft, combining the strengths of the -200 and -300. The main reason airlines use the A330-200 is that its a cheap, versatile aircraft. The A330-300 has much better cost per available seat mile, but does not fly the range needed for some missions. Take for example LAX or BKK to FRA – the A330-300 cannot make the trip with a full load of passengers. Now that the A330-900 has essentially the same range as the original A330-200, airlines can simply upgauge without having to compromise on network flexibility. With a heavier wing and engines, the A330-800 has little advantage over the A330-200 on shorter routes. Therefore, the only remaining niche for the A330-800 are 14h+ flights, but its not an ultra-long-haul aircraft either. My guess is that airlines that operate the A330-200 on medium haul routes will look at the Boeing 797 as a replacement, and those that operate it because of its range will upgauge to A330-800 or 787-9. Wonder what the range of the 900 is carrying same passenger load as a full 800? In that case, I wonder what the fuel burn per seat “of the 900 is carrying the same passenger load as a full 800″…. My wild guess is the 339’s legendary fuel burn per seat competitiveness against 789 will vanish immediately. 4) 2-4-2 seat (18″) layout. Will be interesting to compare seat mile costs in the original planned 789 layout vs the 339. I’d even like to see an analysis of a 3-3-3 787-9 compared to a 2-4-2 A330-900 on shorter routes. Is the A330-900 a more affordable alternative for airlines that do not quite need the massive range of the 787-9? RR intends to supplant all Trent1000 engines on all 787 types with the TEN. That would turn the engine run off to indistinguishable. Differences seen are then solely attached to the airframe : me:expectant! And a few questions re your notes..
U hv no idea where T1000TEN tech came fm and a T7000 is basically T1000TEN + bleed air hardwares? a) Conquered the aero advantages fm the higher degree of wing bending/flexing more easily achievable fm a non-metal wing? b) If higher aspect ratio rules, how come 320Ceo was still on par with 737NG? U still insist airlines/lessors actually care about this when deciding to invest between 330 vs 787? All true. RR can’t be bothered with resolving legacy tech issues on T1000C and older variants. U must be joking if U believe bleedless and bleed are the same deal in fuel burn…. It’s also like saying GEnx-1B and 2B are interchangeble across 748i and 787 platforms(It’s not but many part SKU numbers are indeed shared)….like CF6 actually was across 767 and 744 platforms. And totally forget efficiency contribution(Not a lot, but still a few % there) fm a highly electric architecture(yes, including that battery now burning every 787 to composite ashes) – a common oversight re design diff of 330Neo vs 787 as most folks believe CFRP composite airframe makes all the diff, if any at all. But I should not be surprised as U already assumed T1000TEN and T7000 will deliver “indistinguishable” outcome. Airlines/lessors worldwide are collectively stupid by insisting on ordering+investing on so many 789 but so few 339(and 338) when the 339 clearly demonstrated equal utility+efficiency as the 789 but @ a much cheaper price tag and easier availability. If you operate A332 today, the A339neo should be very intressting, as it should have a comparable range but better CASM. You have the tech, have the crews, etc. Why would you switch to B789, unless you really need all the range? Hawaiian should be a special case, because the want to go direct to Europe, what is not possible for the larger NEO, and the smaller was to small. These are routes Hawaiian is not running today, as the A332 is not capable. Hawaiian originally ordered the 350-800 which could do Europe reliably ( range isnt the issue so much but you need fuel to manage the airspace congestion and weather delays) but moved to the neo when the 358 was dropped. The 789 restores the advantages the 358 once had. Sounds great, how many orders does the 800 have? Unless you are joking its a big fat ZERO. Their last customer, HA, cancelled in favour of the 789. Lets have a look in a years time. Boeing won’t be able to get away with their marketing tactics for ever. After being beat up with the MAGA club for a year or two. Boeing must have spent quite a bit of work and money on this. A little bit of desperation? I follow your page religiously and enjoy your articles. Aviation has really come a long way. Heard anything about this possible A330Fneo? Yes. Airbus sees no immediate market for an A330-800F, they offer the A330-200F for the time being. Me thinks especially the 251 to A330-900 could be a formidable freighter. Well, as the old southern saying goes, “Mule meet 2” x 4”. Maybe now BA will go ahead with a 767 line ramp up! I would rather see the 797.
you must be joking, the 797 as a freighter? Factory build freighters normally have heavier floor beams than the passenger cousins, so they can load some serious cargo on the pallets. As well the longer haul isnt required in most cases, a stopover between North America to Asia is acceptable to carry more cargo instead of fuel. Comfort in the lavatories wont be at at equal seating and comfort standards. Airbus always likes to brag about their seats that are a thumb width wider than the 787, meanwhile they reduce lavatories, galleys, and seat pitch. They reduce the lavs space but there is no change to Galley space (number of CARTs are the same) and seat pitch. And I just had a taste of that new Airbus cabin philosophy on minimum lav space. I was flying on a 320Neo with SpaceFlex lav for the 1st time 3days ago and needed to use lav inflight. The lav on port side behind the aft exit door is the smallest I hv ever seen on any RJ….let alone a mainline narrowbody such as 320Neo. Luckily, the 1 nex to it(i.e. nex to the tiny aft galley) is more normal in size and more importantly, was vacant. That the combo lav where you can join a more or less normal lav with a smalish lav into one wheelchair/helper needed bigger one? I love reading the Boeing troll comments. Airbus is doing very well and producing some great aircraft. Which must be perplexing /frustrating for you re why airlines/lessors still don’t buy any 338….I mean prospective 338 customers(including HA which did ordered it) must knew about the latest 251t variant and its merits long before we learnt fm leehamnews.com yesterday. I don’t like troll comments be they Airbus or Boeing. I’ve yet to see anybody stating that the A330neo is superior to the 787. Would you care to provide a few examples? It’s interesting to note, though, how the B-boys seem to be particularly irked by the fact that the A330neo — developed on a “shoestring budget” — is competitive with the 787. The original A333 and A343 cost about $3.5 billion to develop — or about $6 billion i today’s dollar value. Add a couple of billion for the A330neo — and you’re looking at a pretty good ROI. In contrast, Boeing spent at least $15 billion on R&D for the 787 — deferred production costs not included. The 787 was launched with a lot of fanfare and hubris — and it was supposed to take out the A330! Of course, it must be irksome that the A330 remains competitive with a few cheap PIPs when Boeing spent all that money on the 787. I’d guess that the B-boys may be particularly irked, as well, by the fact that Boeing wasn’t able to do the same thing with the 777 (i.e. relatively cheap PIPs) in order to compete with the A350. People could argue seat mile cost and range this or that way but one thing that stands out that nobody could argue is that the 330(NEO)’s will offer passengers a superior flying experience. Superior flying experience with any plane comes with higher priced seats, that gives you more seat/leg room, better meals, more toilets per passenger and so on. If you can buy a ticket for the same price with the same service on an 787 and 330 which one will most pax choose? Just want to rebut Adrian’s absurd comment. We have made significant investments in the aerospace industry for years, have been subscribers to this letter for some time, and this letter + Bjorn have been a remarkable source of unbiased information. It is one of the most succinct and non-BS publications we regularly read. Fully agreed. Some serious nit picking. I was taught to be able to analyze what I read. I don’t get wigged out about miner phrasings and don’t like the parsing of words when you can figure out the whole picture by reading what is presented. Looks like some don’t have the skill, maybe too much facebook or twits. As someone who seeks nothing more than the cleanest, most authoritative and reliable presentation of facts possible; whom typically spends more time than most do voraciously consuming information from a wide variety of sources, be they press releases, mass and trade publications/blogs of varying degrees of quality (some publications and/or writers/bloggers are consistently better than others), or research reports by prepared by financial analysts and/or consulting firms; and who was a regular contributor to a trade/investor oriented newsletter years ago, PlaneBusiness Banter (c. 1999-2004), LNC’s freely available content is ALWAYS among the first things I look forward to seeing arrive overnight in my email box! I only wish current resources would allow/justify becoming a paid subscriber to access the content behind the paywall since Scott’s other publication during the years my work was being published, Commercial Aviation Report, bar none was my favorite that I could not wait to get my paws on in those days when it arrived by snail mail! So, I can only imagine what’s available now, in the digital age, with Bjorn Ferhm also included behind the paywall! Just the same, even what’s offered here – FOR FREE – is still among the best sources of accurate information, including a great many well known media properties that hide their content behind paywalls and like to imply they’re offering a scoop on something seen and read here days or even weeks earlier than their claims of “breaking news”. Second the comments supporting LNC’s reporting 100%…and nice articulation from Howard here. Thanks for all the detail Bjorn. What modifications are required for the 251T version? Believe with this increase in MTOW there is merit for an A339 stretch (~4.4m/9 panels, +30-40 pax) with a range of ~6000Nm, 76Klb T7000’s should be available? You will be in 359 seat capacity territory but such an aircraft could have applications for shorter high density routes, good belly capacity, could be aggressively priced and compete with the 787-10. Hi Bjorn, some more questions. Will the 251T become the standard model or will the 242T version still be available? …and, will there be a change in MLW for the 251T model? Aircraft and engine OEMs only produce one model, the maximum capacity one for weight variant or thrust variants (for ease of design, testing and production). Then they derate this platform to lower capacity, for Aircraft to a lower MTOW. This lowers the OEM’s price and the airport and underway fees. So once the 251t version is designed (it needs some local beefing + uprated wheels/tires and brakes) it will become the std platform. There shall be no OEW increase as the beefing will be countered with weight down in other places according to Airbus. This makes me wonder if there is not a market for a 330-200CEO with updated cabin (and wing NEO wing?) with ~235T MTOW? 1. There’re only 40 frames remaining in the 332 backlog today. various weight variants such as “~235T MTOW” thru paper derate U already ‘RE-learnt’ about. 3. “Updated cabin” is already available for any 330 customer, including customers for those 40 frames in the 332 backlog, to choose for installation. Heck, U can even install “updated cabin” on 330Ceo built a long time ago if U hv the $. 4. 330Neo wing works with 330Neo engine weight….surely U can’t simply attach 330Ceo engines under 330Neo wings and hope the structural force paths/balance there remain unchanged. Ditto re fluttering risk fm altered airflows on a wing that’s neither 330Ceo nor 330Neo. 5. U can resolve issues mentioned in 4. with lots of $ + development+cert time and but will it be worthwhile when only 40 frames remain in the backlog today? Now that there are no 338 orders and pressure of deliveries will the 338 be certified at 242T or will AB take time to do the modifications and fine tuning to certify it at 251T? The 338 test program could actually become the test bed for the 251T model that could fast track certification of a higher MTOW 339? 251 t certainly is a surprise for most people here and maybe even for insiders. The elongated and re-twisted wings seem to be working really well, and obviously the Trent 7000 also exceeds expectations. So the delay with the engine was obviously not a precursor to problems, but rather showing an effort to boost its performance. Launching this version so short after the start of flight tests also tells us that Airbus was certainly planing (or hoping) for this from the onset, which may also explain why there we so optimistic about the future of the A330. I think the engine delays is spinning things (pun intended) at a bit higher rpm than is justified. Keep your hat on until we see some in service time. I think we can assume that RR has learned from their mistakes with the Trent 1000 and they are now obviously rather taking a delay than reliability issues or lack of performance. That is probably the reason for the delay in the Trent 7000. So instead of being pessimistic because of the delay I think we can rather be optimistic, and the hike in HGW is certainly also due to engine performance. It can obviously be rated a higher thrust without any problems. An advantages of the increased MTOW that is sometimes overlooked is the ability to have still reasonable range at higher seat density layouts (LCC’s) and/or increase cargo carrying capacity. I also appreciate Leehamnews‘ approach to both show the information from the manufacturers presentations and then use a model that takes out the marketing claims to get a better picture, and this is the closest it gets. What I am actually missing in most cases is how cargo revenue would affect the picture. After that, every airline will also have to make the business case for the airplane it buys, and there are other factors individual to the airline’s business that can tilt the choice in one way or the other. (route network, individual capital cost, commonality, proportion of premium passengers, etc.). In the case of the A330neo, especially with the 251t version, it would actually be interesting to do both a normalized LCC analysis, both with a Level/Norwegian type of layout, but also with a super high density 9 abreast layout in the A330 to show how this affects the economics. Yeah – I still think there is a market for a 9-abreast ‘LCC’ cabin between doors 3 and 4 [the back], with std. 8-abreast between dorrs 2-3 for regular airlines. It would allow the airline to compete in a like-for-like way, provide the LCC ‘service’ [purchase food/drinks etc] in and to that rear ‘cabin’, and provide the regular service to the mid-section cabin. Differentiation based purely on ‘bags’ seems a bit old-school these days, and mixed-cabins disallow the meal/blanket/amenities options being pulled/paid for on demand. Klauss: Agreed, that is often a key missing metric on Cargo, reports of the A380 and its issues are due in part to lack of cargo capacity. I remember the screaming when the airlines seemed to realize it would not be like a 777 (it went away fast). Very likely its a part of the need to keep it pax full or fail in revenue. Those routes between major hubs will have a need for cargo and also heavier seats/higher baggage allowances for their premium passengers. Those 8-12 hr flights will need lie flat seats up front. See it more LCC orientated with a couple of rows premium. On an 338 with 300 pax and range of around 7000Nm? Depends on the airline. Delta, Lufthansa, Swiss, Air France definitely more premium. Another niche for the 338 is that it can be an ideal 359 partner with similar range and an airline could alternate the two aircraft on routes depending on demand optimizing seasonal load factors. Wonder if HA (for example) every considered that? Thanks for this post. As predicted, the A330Neo will be a spectacular aircraft at a reasonable price. Of course, Boeing does not like this but they should have anticipated this. Airbus builds planes with room to increase performance. Expect even more performance improvements. The fact that the A330 now seriously competes with the 787 and even beats it in range should not be ignored. An 8 abreast ultra long ranger for thinner routes sounds brilliant to me. I personally think the -800 will open new markets for many carriers. It also shows that the Hawaiian swap was non-sensical, other than perhaps for near dumping prices by Boeing. With a combo order of A330-800 and A330-900 they would have been able to fly anywhere they wanted, increase capacity, and maintain comonality with the existing A330’s they have. It just doesn’t make sense. 757 replacement to a 767/A330 replacement. That should also indicate some of how good the A321LR and the plus version is expected to be as a single aisle middle range plane. and A350. Fun times ahead! Amazing how they keep getting more and more from the frame, and a great frame it is for passengers and cargo. Love it… so hope and believe it will continue to succeed. I do wonder what further SFC benefits an AlLi skin would have added to the frame…assuming the same production line and tooling would be used and dev/retooling costs minimized, would it knock another 5% off the SFC? Could they do a 330-shrink [a310 size] with an Alli skin and new wing [maybe same wingbox] to address the 270 seat NMA? What would AlLi for for an a321 [or a322] if they make that their 220-NMA approach. The endless iterations of the paper NMA are very much a 767 replacement right now. Boeing said yesterday that it will not involve revolutionary new tech, but off-the-shelf/well-understood harvesting of latest tech. Really can’t see where they can garner huge SFC improvements without a large change in tech… but hey… we all await the ‘reveal’. Anywho… good to see AB continue their improvements – regardless of the ‘real-world’ numbers – which would be lower for both Boeing and AB]. Hope to see the the neo’ing of the non-commercial a330 derivatives also [cargo/mrtt etc]. The density of AlLi is about 10% lower than “normal” Al-alloys with a similar strength and elasticity. This means a weight reduction of only 2-4% for the complete plane, depending how many parts and panels you can actually make from it. Assuming there is no difference in the shape or size of the aircraft, the SFC may be down 1%. On the other hand it would require significant cost in development and certification, which is probably the case why Al-Li is used on new planes but not for “updates”. Jose: We don’t know the A330NEO beats the 787 on range, its not been apples to apples tested in the Leeham model. It may or may not have a bright future. Right now its not so good. Longer term that may change but the 787 tea leaves sales say otherwise. I recently read that AB is considering a cargo version of the A330neo. The article mentions that potential customers ask for a stretch. Maybe an A330-1000(F) will be announced soon. The Premise is that Boeing is inhibited by the KC46. Airbus has done poorly on the A330F and the PFC have been few as well. The logical progression (if that remotely possible) is an A330CEO 300F, but I assume that they used the 200 for a reasons of weight vs carry capacity buts as Boeing did the 767-300F and the 777-200F based aircraft. Cans don’t cross and while that can be dealth with, its another factor to determine the whole situation and costs. Thanks for the link. As mentioned earlier there is potential for an 339 stretch (330-1000) with +30-40 pax and range of around 6000Nm. A freighter could use this as platform if there are interest. Its easier to make a freighter from the A330’s Al-fuselage than from the CFRP based 350’s and 787’s. Eventually there will be a large source of older 773ER’s that could be converted, not sure how its OPEX will stack-up against an “A330-1000F”? Anton, forget about a stretch for the A330. Airbus has done that mistake with the A340. It would just be too long and thin and that would require reinforcements in the fuselage that make the whole plane too heavy. You would need CFRP to make a fuselage longer and thinner, as it offers much better tensile strength. But then we are in the initial A350 design bracket, and that is obviously not worth the effort, hence the A350. You want a larger plan, just take the A350, end of story. Thanks for the input Gundolf, but looks like another of my “pets” got a sliver bullet. Was wondering what the Boeing spin doctors are telling airlines, but the OEW of an 359 is only 5% more than the 789 while it can carry 12% more pax, the 359’s range is also at least 500Nm more than the 789. Qantas, Hawaii and others eat you hearts out, as for EK when the 787-10 slogs out of a hot Dubai with limited range. ….and there are XWB-EP’s in the pipeline for the 350’s, and for the 787’s? There’s a myth that the A340-600 OEW increase was due to the stretched fuselage. In fact, most of the OEW increase was caused by the much heavier and enlarged wing. The max fuel capacity was increased by 40 percent, which meant that the “new” centre section had to be able to handle the increased dry weights, in addition to an additional 45 metric tonnes of fuel. That’s why the two-wheel centre gear on the A343, which is not a landing load bearing gear, was swapped out with a load carrying four-wheel bogie centre undercarriage on the A345/A346. Now, the 757-300 has a 23 percent higher OEW than the 757-200. In contrast, the A340-600 has a 36 percent higher OEW than the A340-300. Both the A346 and 753 were stretched by about the same relative amount over that of the respective base versions; the difference being, of course, that the 757-300 has a significantly higher fuselage fineness ratio than the A346 (i.e. fuselage length divided by cross section). Hence, the stretched 757-300 required more relative structural reinforcements in the fuselage than what was required for the A340-600. The A340-600 was stretched by 20 frames over that of the A340-300 — 3 frames in the wing/centre-section; 6 frames in the aft fuselage and 11 frames in the forward fuselage. I’d not be surprised if an A330-1000 would be stretched by 6 frames in the aft fuselage and 7 frames in the forward fuselage; or by 13 frames in total. That would increase LD-3 carrying capacity on the lower deck to 18 LD3s in the aft hold and 22 in the forward hold. Finally, therefore, a 13 frame, stretched A330-1000 would have much less relative growth in OEW than what was the case with the A340-600. IMJ, a ballpark estimate would be in the neighbourhood of a 15 percent growth on OEW for an A330-1000 over that of the OEW for the A330-900neo. Of course, an A330-1000 could be stretched by less than 13 frames. But what to gain than a shorter range A359? A339 and A359 are already close, there’s maybe a 30 Pax difference. 63,66m vs. 66,8m and a little wider fuselage. It’s adressing the same market as the B787-10 with same issue, e.g. lack of range. The 10 accounts for 171 (with Emirates 40s for 211) of 1300 – is there any sense to built anopther plane for that niche? The topic in question was about a possible stretched A330-900 freighter (i.e. A330-1000F). If launched, Airbus would very likely offer said aircraft in a passenger version, as well. About one tonne heavier per engine: 4990 kg (T500) vs. 3990 kg (CFM56-5C4) — not including fluids and nacelles. I also think it’s more honest to leave the airbus talking points in their own slides, rather than translate/condense to Leeham visuals. Ok, not getting into the politics of things as above, but it’s a shame Airbus didn’t change the overhead bins as in the A350. They copy the winglets, they copy the intention Mood thingy, whats next? @TransWorld: You kind of already failed at not coming across as a fanboy if you think they’re copying Boeing with mood lighting, ffs. Unless you’re being facetious, though I doubt that. Good point, MTOW often restricted by airport altitude, temperature and runway length. One of my dump questions, could AB make available an 76Klb T7000 for airlines operating out of such airports? A 76Klb 1000-TEN is used on the 787-10. I would say it can be. Often? Be interspersing to do a list of what is an impact. Hot is not nearly as bad as high and hot. J-Burg, Denver, Salt Lake, places in South America. If you follow my Corners you’ll learn the induced drag is the key metric for take-off performance, both for normal ISA conditions and for hot and high. While the A330neo has the same thrust rating of 72klbf for the Trent 700 and the 7000 on the 242t A330ceo and neo, the neo wing is 4m wider. I made a quick check in the model. To keep the same take-off performance as the A330ceo 242t with a Trent 700 at 72klbf, the 7000 shall be rated at 75klbf for the 251t A330neo. This within the TEN versions capability as it’s rated at 78.9klbf on the 787-10 (TO Thrust ratings for engines is a software change as long it’s within the top versions envelope). Thanks a lot Bjorn. Guess the 338 could get away with 72Klb due to smaller wetted area/drag. Any idea if AB is considering the higher thrust option? Arent the higher thrust versions of a engine choice up to the airline to negotiate with engine maker ? The software change means its an easy option for Airbus to test out for certification at any time. An 338 certified with 251T MTOW and 76Klb thrust rating will put it in a league of its own. A 250 seat TA stallion. The overall market is potentially small but could be a niche for the the 338. Coming from Africa there are a number of airports with altitudes of 1500+m with temperatures of 30+C. If you want to know what these conditions can do fly out of JHB with an 707 on a hot day, white knuckle stuff. On the original launch of the 330neo, Airbus said that the SFC will be reduced by 12% from the T7000, while there will be 2% penalty from the larger frontal area and weight, so in total 10% better than T700. Now the presentation says 11% better performance. This is just SFC or total? It’s the global powerplant saving of fuel. Again one of my low knowledge base comments, does AB’s confidence to increase the 330NEO’s MTOW at such an early stage indicate that it could actually be more efficient on shorter (<5000Nm) missions than predicted? neo doesnt beat existing A330 on shorter missions. Thanks, done some matchbox calcs, the higher engine weight should be offset by less fuel required for flights of >6 hours, wing and aerodynamic clean ups should more than account for larger engine’s additional drag. Engine based on the RR Advance3 core, fan size 95″-100″? If you are AB, you show the cumulative orders in the past x years. If you are BA, you show the orders in the past few years. Still amazing that the 330x sold so well since 2004. But this graphic reinforces my sense that few 330 got sold in the past 18 months. The 787 did. But nice to see the total numbers. Of course, 350 and 777 are not included for the larger picture. I think still that BA here is enjoying the NMA wave while trying to stunt the 330 from the top ()vs. the 321 from the bottom). If you are an airline, you wait. So the 330 market is ‘frozen’ for now. Great overview of the Evolution of the A330 program from Launch in the 90s to today! Thank you! Are the slides from an AIRBUS Source which we could Access? For the B-boys there is a press release out on the 1st delivery of the 737-9. Will not elaborate as Scott will soon, make up your own mind how twisted it is compared to factual presentation by AB on an 251T 339 after several months of test flying. 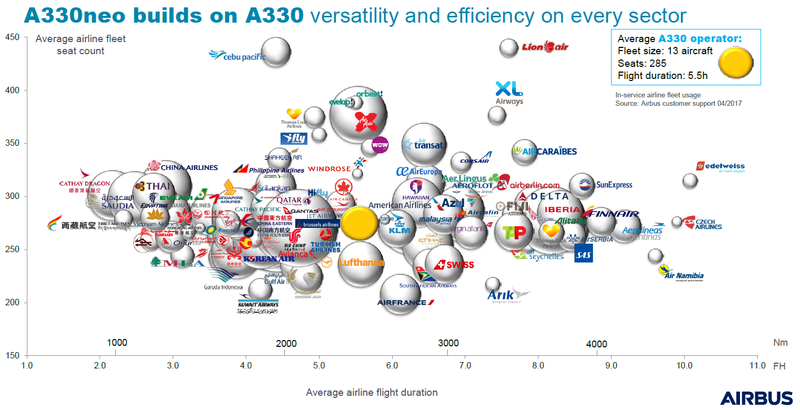 Will the A330-800 and the A330-900 cruise as fast as the A350-900? I am definitely the wrong guy to answer but the 350’s (and 787’s) seems “fast” from data. End of the day how much time do you spend in take-off ques and landing holding patterns? Pilots will be the best to answer, but on an 10K-km route the 330’s about 15-30 minutes slower? No, the A330 and 340 series are designed to cruise at M0.82, the 787 and A350 at M0.85. Not sure how accurate the seat display seat indicators are but been on many 744 flights where the (air speed?) readings hangs around 1020-1040km/hour for long periods of time (wind direction). Cruise altitudes in these instances mostly around 36-39K feet amsl. At long last our Mick ‘O’LEARY has got his hands on some Airbus aircraft by buying 75% Nicki Lauda’s airline now that is a shock to system i had the impression he only buys cheep Boeing’s 737’s to sell cheep flight’s see youtube Fascinating Aida for the best song that take the mick out of Mick. Those planes operated by Niki/Laudamotion were all leased, the FT times says they will be using planes provided by its new major shareholder, Ryanairs 737s. Saw that, he looks fairly happy about the situation. Alitalia next? Have people ever thought how Ryanair could “mess-up” the European long haul scene with flying into a couple of their hubs like Dublin from NY, LAX, Beijing, Delhi, .. with a few A380-800’s? Still believe Rome could be key to the European airline struggle, locality, weather, etc. See link to A338 “propaganda” on AB website. Those two TAP pilots looks really happy have flown the 339 for the 1st time, sign of a good aircraft? This could potentially be more important than a lot of things said today? Interestingly, the new 251t version of the 339 makes DTW-ICN within range for Delta. And they were the launch airline for the 242t A333. One wonders if Delta is considering substituting any of the deferred A350 orders to additional 339s? They could keep the current 339 order book at 242t for Atlantic flying and lower landing/nav fees, and maybe swap 10 330neo HGWs from deferred 350s? In theory, the 338 would have the range for Delta to fly ATL-JNB, their longest route. And Delta operates a 332 subfleet now for select Pacific flying as well as some thinner Atlantic flights. Again, just rank speculation, but I wonder if Delta is really getting that much bang out of their marketing buck for the A350? J-class suites and a true Prem Eco could of course be installed on the 339 or 338. The dimensions aren’t the same, so some changes would have to happen. I’d be in favor of a 2-3-2 Prem Eco, for example. I’m not sure of the realestate issues to get the Vantage XLs 1-2-1 on a 330neo. One thing AB can’t ran away from is that they eventually need a replacement for the 330’s, these are also to heavy and long range for an NMA/MoM. (A339 size) 33X-2, 290 seats, 4500-5000Nm range. Not sure what cost will be be involved and what airlines response will be, a clean sheet design always better, but an option. Relatively low cost and technical risk, good cargo capacity, shared 330 assembly line, etc. An 33X and 322 could water down the 797’s business case? Anton, I’m actually quite sure that we’re done with aluminum planes. It looks more like the 777X and the 330neo will be the last updates/upgrades with aluminum fuselage. The 787 and A350 have been a turning point in the history of civil aviation and there’s no turning back. Looking again at Airbus options you may discover that with the integration of the C-Series they now have a free hand to develop a maximum sized single-aisle airliner. And indeed you can make a CFRP fuselage longer and thinner than an Aluminum fuselage due to its higher tensile strength and Young modulus (stiffness). This is an effect you can see on the wings of all modern planes, they are thinner and longer than Al-wings ever could be. I also think it more reasonable to offer alternatives to airlines that actually differ from the competitors products. You certainly don’t want to end up in a situation similar to Tristar vs. DC-10. Thanks Gundolf, someone said its not “easy” to make freighters from CFRP fuselage aircraft? If so 2nd hand 777’s and 330’s could become valuable assets in future or the 330 could live on as the 767 in freighter form? The 787-10 has started to take orders away from the 350’s. Another of my stupid questions, which of an 76Klb T7000 or XWB84 de-rated to 76Klb should have the lowest SFC? What will the theoretical MTOW of an 359 with 76Klb engines be under “standard” conditions? Until a week or 2 ago the 350-800 was still on Airbus website but has now been take off. Don’t know what to make of it, one possibility is that the 339’s performance significantly better than predicted and that an 350-800 wont be able to improve on it? The 338 is still on the web site. Right between the 333 and the 339. I’m looking at the details page right now, on Mar 22. I referred to the 350-800/358, will have a look again thanks. Am I correct in assuming that this new increased range comes through some combination of cabin configuration revisions and increased fuel tankage? What is the maximum possible fuel quantity that any A330 can theoretically hold in its tanks? Reasonable approach for an estimate I guess. Curious to know how much more space for fuel can be achieved theoretically on A330. Like how Airbus unlocked more volume on the A350-900 to make the ULR possible. I have no idea if auxiliary tanks are in use or these figures are reached by wing and center fuel tanks only. The A340 -500/600 had a new wing, about 25% bigger,the A340-500 had whats called a Rear Centre tank behind the Landing gear bay. Just a general comment. If the oil price stabilizes say around $80/barrel 5 years what aircraft will airlines need? Interesting to see where the A330 NEO ends up in the market? For me it looks a very capable bus that calls into question the B787 spend? Just what did they spend tje money on — hype? However all this AB progress makes a mockery of their top end MoM’ster chat. Everything points to it being a 125T OEW HD lard bucket. Wonder if they have a MD — medium duty — A300MK3 or 4 in the works? What can they put in the market with a 90T OEW? 58M fuselage or a 63M fuselage? 5K NM nominal range or 6K? Space for 330, 360 or 390 standard long haul economy seats? The engine might be tricky. Or they go for a B757 solution and re-use something bigger. Should help with time on the wing. Might be a parts bin special with a new fancy, hi-tech twisted wing but it would help fill part of the MoM gap.